Interesting…Planned Parenthood claims that only 3% of their business is for abortions – but when Texas stood firm, Cecile nearly choked on her own vomit. I suppose it’s tough being an anti-prophet in your own hometown? You’ll get that later. ‘Undue burden’ keeps abortion facilities open. Undue burden kills unborn children; undue burden costs tax payers millions without apology. But then HB2 happened, and the sea of hijacked burnt orange just got a little quieter. “Planned Parenthood’s political arm is embarking on the most aggressive campaign it has ever waged in Texas, with plans to spend $3 million to turn out voters for Democratic candidates including Sens. Wendy Davis for governor and Leticia Van de Putte for lieutenant governor.” Read the rest here. A blog who claims ‘our core audience is the progressive, Democratic base in Texas‘ wrongly said, “As a result, nearly one million Texans now face a minimum of 300-mile round-trip journeys to access their constitutionally protected health care.” Actually, it’s a blatant lie. First, abortion is NOT healthcare. Second, what should have been said was that ‘women who are in childbearing age that MAY abort could face a longer travel time to sacrifice their unborn child to the abortion czars’. Typical proabort lies and scare tactics. Undue burden test is defined as a “constitutional test to decide the constitutionality of particular law. State regulations affecting undue burdens are regulated by the courts under the test.” Who has to prove undue burden and how can it be proven? How can anyone know that answer? You can’t, it’s all an assumption based on probability. THAT keeps abortion facilities open. A recent article noted that since the closing of the El Paso abortion facility, it put an undue burden for women to travel over 500 miles to the nearest abortion facility. What that liberal biased article failed to note is that women in El Paso can travel LESS than half that distance to a New Mexico facility, and one is about to open [praying to God it does NOT] in near Las Cruces. So, where is the undue burden? 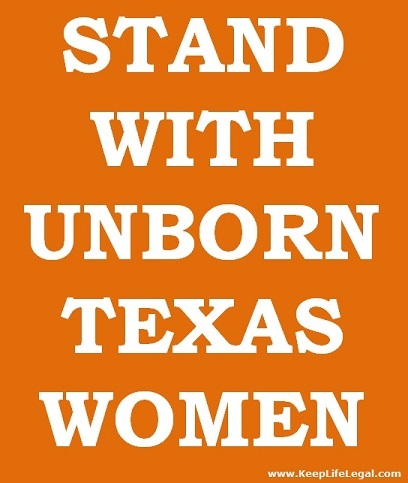 It would seem that the undue burden has been placed on the abortion czars of Texas to stay open, to implement all the improvements to keep women safe. After all, isn’t that the true war on women? How much more do women have to suffer to keep bad law on the books? Click here to read more on the hazards of ‘safe, legal and rare’. But then there’s last desperate attempt to continue to violate women and unborn children…. “The motion [to the SCOTUS], which had been expected, is a final attempt by providers to save about 13 clinics that closed last Friday, the day after the ruling from the 5th U.S. Circuit Court of Appeals…..That court, one of the most conservative appellate courts in the country, found it was in the public interest to greenlight enforcement of the regulations, which require abortion facilities to meet the standards of hospital-style surgical centers and abortion doctors to obtain admitting privileges at a nearby hospital.” Read the rest here. To think that serving women through better law is an undue burden…the nerve. Proabots can wrestle with the law all they want, but the true undue burden is on the unborn child. A baby within the womb has NO rights, NO liberties, NO protection within the Constitution. Unborn children bear the burden and die for a person that was supposed to love and protect them for their entire life. Next postNPR: You get the liberal bias you pay for.